This is a portion of HiRISE image PSP_003542_2035 which shows a dark slope streak north of Olympus Mons, in a region was covered by Mars Orbital Camera image R09/00701. (This portion is rotated with south up so that the direction the streak flowed is towards the bottom of the frame). This image shows that the slope streak forming process altered the pre-existing surface both by excavating material and depositing it. 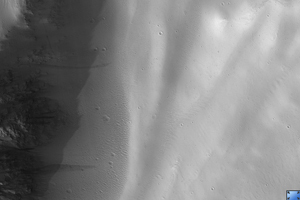 The fine scalloped texture of the surrounding surface is not present within the streak, and there are low linear mounds within the streak that are not seen outside. Their absence outside the streak indicates that the formation of the mounds resulted from the streak formation process. There is a large boulder or knob within the streak near the top of the frame which the dark slope streak appears to have flowed around, leaving a light-toned patch of the surrounding surface material intact downstream of the boulder.